Thorry Gunnersen died on 4 February after a long period of illness. For many decades Thorry has looked down at DBYC from his eyrie ‘The Moorings’, with the Norwegian flag flying when he was home. We have been thinking of Thorry and Jo these past few months when he has been at home ill and especially the last couple of months when he has been confined to bed. Thorry ran a very successful timber business. He was awarded an Order of Australia on 26 January 2002 for service to the forest industry particularly to sustainable timber resource management and development and to the welfare of communities dependent on the timber industry. For over 30 years he supplied all the plywood needs of Jayco Caravans. HIs father was the President of the Ranelagh Club. With his brother Peter and the Hornidge boys he sailed to DBYC in 1954 to participate in the racing and joined the Club soon after. Thorry was the only person I knew at university who owned a sailing boat. Later Thorry sailed ‘Gumblossom’, a 28 foot boat designed by Peter Joubert, a professor of engineering at Melbourne University. He sailed to NZ in this boat and circumnavigated each of the 3 main NZ islands. He then had Joubert design the 40 foot ‘Tilting at Windmills’. This is a unique design being designed both for ocean racing and then able to cruise with the addition of extra gear. 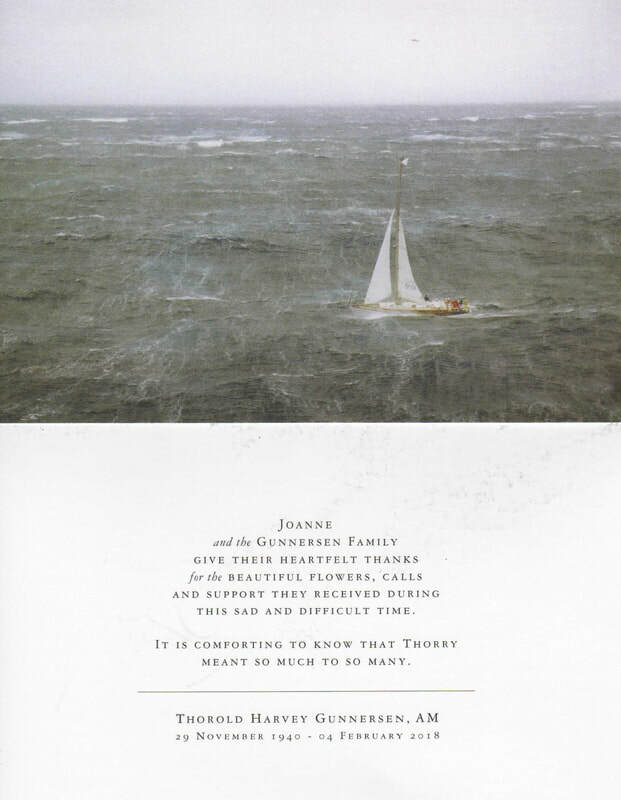 Thorry campaigned TaW in many races, including 13 Sydney to Hobarts and in the notorious 1998 race he was the most easterly yacht as he escaped the storm. He has taken TaW to Europe where he extensively cruised UK waters, North Sea, Baltic Sea and North Atlantic. He contributed many articles on these cruises to DBYC publications. Thorry is the only non-Englishman to have been awarded by the Royal Cruising Club the prestigious Romola Cup, a prize for ‘A significant cruise of no set duration or destination’. He won it in 2009, the 100th anniversary of the prize. He served on the Committee at DBYC and was Rear Commodore. He has been a very generous supporter of the Club, his cleaner for many years cleaning on Monday mornings, donation of the RIB ‘Moorings’, donation of car to take boats up and down Rob’s Way and his recent donation of a complete set of Neville Shute’s books.